Microsoft’s latest operating system can encode data in some versions via BitLocker even on external drives and USB sticks. However, Windows XP or vista PCs cannot read this data in some cases. 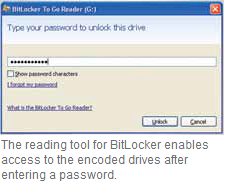 Windows 7 normally copies Microsoft’s BitLocker To Go reading tool immediately during encoding to the external data carrier, but it is of no use if the source system is running a 64-bit version of Windows and you want to read the USB stick on 32-bit XP or Vista. For such cases, Microsoft offers the tool in two versions that can be downloaded from http://goo.gl/yUiM. To install it, unzip the ZIP archive. On 32-bit systems, start the fi le ‘KB970401-x86.exe’, and on the 64-bit systems, run ‘KB970401-x64.exe’. The installation takes place without further queries, but requires a restart. To use it, close the relevant encoded drive and start the tool via the Start Menu. Then enter the password that has been entered during the encoding of the files, and click ‘Unblock’. The data is displayed similarly as in Windows Explorer. Direct access is however still not possible. Instead, copy the data via drag-and-drop to a local drive so that you can work on it there. You can change and save data on the encoded drive only in Windows 7.